An Anthropology of Biomedicine is an exciting new introduction to biomedicine and its global implications. 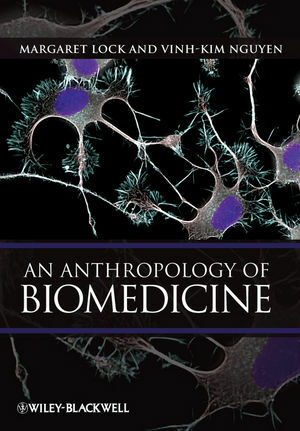 Focusing on the ways in which the application of biomedical technologies bring about radical changes to societies at large, cultural anthropologist Margaret Lock and her co-author physician and medical anthropologist Vinh-Kim Nguyen develop and integrate the thesis that the human body in health and illness is the elusive product of nature and culture that refuses to be pinned down. Margaret Lock is the Marjorie Bronfman Professor Emerita in the Department of Social Studies of Medicine and the Department of Anthropology at McGill University. Among her numerous awards are the Gold Medal for Research by the Social Sciences and Humanities Research Council of Canada and the Wellcome Medal of Britain's Royal Anthropological Society. In 2005 she was awarded both a Killam Prize and Trudeau Foundation Fellowship. She is the author and/or co-editor of 14 books and has published more than 190 articles. Vinh-Kim Nguyen is a physician and a medical anthropologist. He practices medicine in Montréal at the Clinique l'Actuel, which specializes in HIV and hepatitis, and the Emergency Department of the Jewish General Hospital, and teaches at the University of Montreal where he is an Associate Professor in Social Medicine. As a researcher, he is affiliated with both Global Health Unit of the Montreal University Hospitals' Research Centre and the Max Planck Institute for Social Anthropology in Halle, Germany. He was recently awarded the Aurora prize for his research by the Social Sciences and Humanities Research Council of Canada.